The new efficient and versatile self-priming pump LKH Prime has now been launched. The new Alfa Laval LKH Prime self-priming pump is a versatile product with superior efficiency,reduced noise levels as well as meeting the latest hygienic design standards.Based on the well-known and market-leading Alfa Laval LKH pump range, the new LKH Prime is reliable and easy to maintain for shorter downtime. Setting a new standard in self-priming pump technology, the LKH Prime uses a combination of air-screw technology and advanced design to meet the most stringent requirements in food, dairy, beverage, pharma and home care industries. An UltraPure model with enhanced surface finish options, full material traceability and validation documentation via Q-doc is also available to meet the standards of the pharmaceutical industry. The high efficiency of the LKH Prime translates into reduced energy costs. An estimated 10% of all the energy consumed in the world is used by pumps, and for a typical factory in the food, dairy and beverage industries, that figure can rise to up to 50%.Energy savings are a big deal for our channel partners’ customers. They are also interested in reliability. 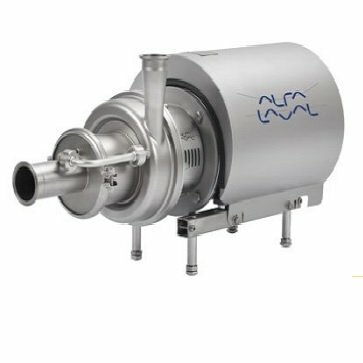 Energy savings,reliability, versatility, reduced noise levels, hygienic design – Alfa Laval LKH Prime ticks all the boxes. The LKH Prime fills a market need for an efficient, versatile,hygienic self-priming pump, quiet in operation, that can perform CIP duties with liquids containing entrained air.Though designed primarily for CIP duties, it can also pump product,potentially reducing the capital investment when designing process systems. Boasting all these benefits as well as belonging to the trusted LKH platform, the new Alfa Laval LKH Prime creates prime business opportunities.